Tuna patties and macaroni and cheese are a classic pairing but why not take it a few rungs higher on the culinary ladder by using fresh tuna instead of canned? It's a flavor sensation. And there's no need to kick macaroni and cheese to the curb, especially if you gourmet it up with more exotic cheeses. This upscale spin on traditional tuna patties or tuna croquettes is made with fresh tuna. Yellowfin or ahi, as in this recipe, are good choices. Variations can include adding red pepper flakes, red bell pepper, chopped kalamata olives, capers, and garlic and onion. Remove any blood lines from tuna and dice into 1/4-inch pieces by hand. Don't use a food processor -- you will end up with a paste. In a medium bowl, mix chopped tuna with breadcrumbs, aioli, shallots, parsley, salt, pepper, optional Old Bay seasoning and lemon juice. Use a light hand to mix so the tuna doesn't become compacted. Form mixture into 3/4-inch thick patties. If desired, for easier breading, freeze patties on a parchment-lined pan for 15 minutes. While the tuna patties are in the freezer, make the lemon sauce by combining the crème fraîche or sour cream, garlic, lemon juice and lemon zest in a small bowl until well incorporated. Refrigerate until ready to serve. Put the breading ingredients in separate dishes. To bread the patties, dredge them in all-purpose flour, then in beaten eggs, and then in panko crumbs. Place them on a parchment-lined pan to dry for 10 minutes before frying. Heat a cast-iron skillet over medium-high heat for 3 minutes until hot but not smoking. Add about 1 inch of oil to the pan, swirling to coat the bottom. In a single layer, place patties dry side down and pan fry until medium golden brown, about 2 minutes. Flip patties and fry another 2 minutes or until second side is medium golden brown. You don't want to overcook this beautiful fish. Remove patties from skillet and drain on paper towels. Serve hot with lemon sauce, remoulade, tartar sauce or Asian fish dipping sauce. Garnish with lemon wedges or slices and sprigs of parsley, if desired. Serve with gourmet macaroni and cheese and steamed vegetables or a garden salad. This recipe works well with fresh salmon, tilapia, salt cod and just about any other medium- to firm-fleshed fish, and most people know the glories of crab cakes and shrimp cakes. 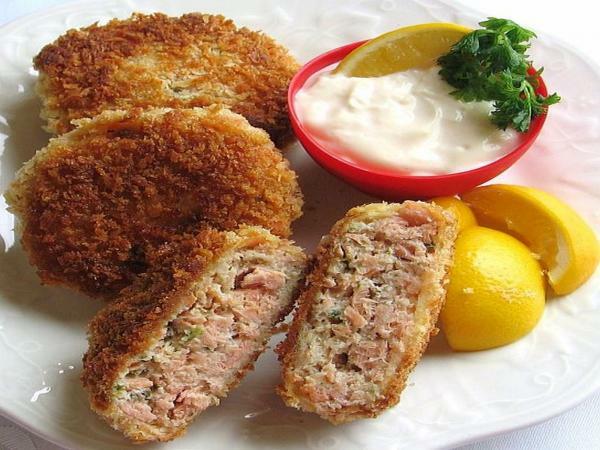 You also can make fish patties/croquettes with cooked fish. If you'd like a lighter version of pan-seared fish patties, give them just a quick fry in a nonstick skillet and finish them in a 350-degree F oven for 20 to 25 minutes.